The Create Company event adds either a new company and links the newly created contact to this company OR adds this contact to an existing company inside Infusionsoft based on the criteria you specify. 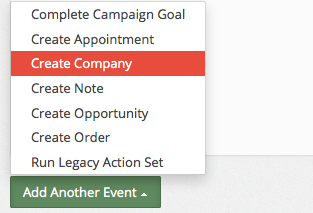 Select Create Company from the Add Another Event Dropdown. The next step is to choose the Duplication Method to determine if a company record already exists under that name inside your Infusionsoft account. Don't check for duplicates, always add a new company - This method will always create a new company, regardless of whether or not there is an existing company with the same name. If Company Name already exists with the same Name only - This method will check to see if there is an existing company with the same name. If there is one, it will update the company record with the new data. If Company Name already exists with the same Name and City - This method will check to see if there is an existing company with the same name and city. If there is one, it will update the company record with the new data. If Company Name already exists with the same Name and State - This method will check to see if there is an existing company with the same name and state. If there is one, it will update the company record with the new data. Use a provided Infusionsoft Company Id - This method will check to see if there is an existing company with an Id that equals a company Id provided. From here you can map the fields that you created from your Webhook or your Email to existing company fields inside Infusionsoft. To do this, select an Infusionsoft field from the dropdown menu on the right for each corresponding field that you created on the left. If you wish to skip a field and not add it to the company record, select Skip this field for this Event. Once you are finished matching your fields to fields inside Infusionsoft, all you have to do is hit Save Company and, voila, you are done.